Athens, Meteora, Mykonos, Santorini, and more! Gay holidays in Greece can mean a lot of things. 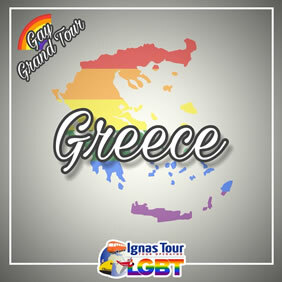 Long nights in the amazing gay bars of Athens, sunbathing at Elia Beach in Mykonos (one of the most famous gay beaches in the world), romantic honeymoons on alternative islands, gastronomic experiences and adventurous walks in some of the most beautiful and breathtaking landscapes of the Mediterranean. 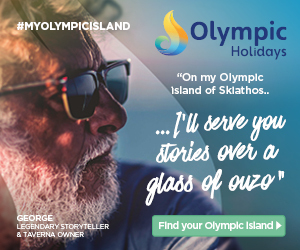 Explore Greece’s magical land of myths, legends and beautifully bronzed men. And we’re not talking statues. Athens, the vibrant and never sleeping capital of Greece, features the most organized gay scene in the country with gay bars, clubs and restaurants, saunas, shopping areas and several cruising spots. Athens is a great city to spend your gay holidays during winter and early spring. The city is the home to numerous gay places, which usually get pretty crowded on Fridays and Saturdays. On the other days, like Sundays and Mondays, the gay clubs organize some special nights like Greek Mondays and Drag Sundays. 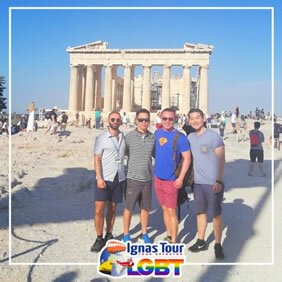 • Buffet Breakfast and meet our LGBT Friendly Tour and be ready to enter one of the most important archeological site in the world: Athens' Acropolis! • Enter the Acropolis from the south slope to avoid the crowds and also to visit the Dionysus sanctuary and Dionysus Theatre built in the 5th century BC. On your way to the Acropolis, enjoy the marvellous view that unfolds before your eyes. • Explore the mighty Acropolis on foot to see the glorious Parthenon, the Erechtheion, the Propylaia, the Nike Temple, the Agrippa Monument and other highlights. Learn more about its history, observe the statues from archaic period, Caryatids, and of course the Parthenon hall. • Afterwards continue to the Agora, among the ruins of public buildings where we will see the temple of Hephaestus, the best preserved temple of the ancient times. • The tour ends with a short walk to the ruins of the Roman Agora, in the heart of Monastiraki flea market area. • Lunch on your own. Afternoon free for individual visits and shopping. • Dinner on your own and overnight at your hotel in in Athens. Rainbow Tips: Gazi area (metro station: Kerameikos) and Agias Eirinis Square (metro station: Monastiraki), are the top gay areas in Athens. Spend some spicy time in the popular saunas of Athens, including Alexander and Flex. In Gazi, you can visit Sodade bar – the classic gay bar for many years – or Shamone. • Buffet Breakfast and departure northwards towards Delphi, which used to be the most sacred place in the world and a pilgrimage center for many centuries in antiquity. • You will admire the Sanctuary of Apollo, walk the Sacred way, and visit the temple of Apollo, home of Pythia (the oracle). • We continue to the local museum with the famous bronze statue of the Charioteer. • In the afternoon we will be crossing the mountains of central Greece to arrive in Kalambaka. • Dinner on your own and overnight at your hotel in Kalambaka. 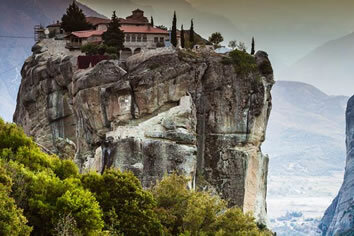 • Buffet Breakfast and be ready to visit one amazing Greek sightseeing: Meteora. • Watch these amazing rock formations, like towers of sandstone, stand ageless, and have provided sacred retreat for monks over the centuries. A number of monasteries are hidden on top of Meteora. The view over the plain is breathtaking. • Meteora is considered among the most beautiful areas of mainland Greece and belongs to Unesco's list of world heritage monuments. • After our visit, we will take the road back to Athens. • On the way, we will make a short stop at Thermopylae, to admire the statue of Leonidas king of Sparta. • Dinner on your own and overnight at your hotel in Athens. • Buffet Breakfast and departure with private Car or Minibus transfer to the port of Piraeus to catch the local ferry to Mykonos. • Arrival in Mykonos and transfer to your hotel. • Rest of the day at leisure. Well, Greece is not only about Mykonos, but we would be lying if we said that Mykonos is not a must-visit gay destination. Mykonos has won the heart of every gay traveler that has visited it, either we are talking about gay couples or single gay travelers. Mykonos transforms into a big gay hotspot every summer, so you will find gay men everywhere. Elia Beach and Jackie O' are the most popular hotspots! • Dinner on your own and overnight at your hotel in Mykonos. • Buffet Breakfast and day at leisure to explore the famous island, a meeting point of the international “jet set”. • Discover its amazing beaches, and enjoy the unique night-life. • Rest of the day for beach and shopping. Rainbow Tips: Spend endless hours under the hot sun at the most popular gay beach, Elia. Party and flirt at the upcoming gay beach hot spot of the island, ’JackieO Beach’ at Super Paradise. Mykonos Town (or Chora, as Greeks call it) is perfect during the night. Make sure to have a cocktail at JackieO Mykonos Town. For the more naughty ones, rumor has it that the area behind Paraportiani Church is a popular cruising spot – just be careful of the rocks! 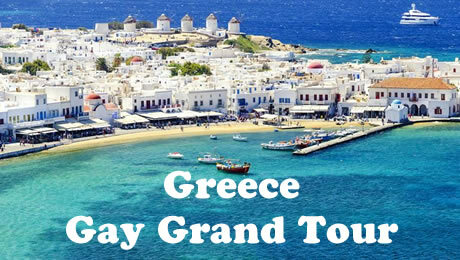 • Buffet Breakfast and transfer to the port of Mykonos in time to catch the local high-speed ferry to Santorini. • Arrival in Santorini and transfer to your hotel. Santorini might not be a popular destination for its thriving gay scene, however, gay couples are in love with it. It's not difficult to guess why, Santorini is among the most romantic destinations around the world, to spend your honeymoon, no matter your sexuality. Santorini, one of the most beautiful and romantic islands in the world, is a must-visit destination for any traveler who wants to have an updated travel journal and a hot choice for gay honeymoons. It’s not just the dramatic landscape with the volcano and the steep cliffs but also the overall luxurious and elegant character that emerges from the iconic island. • Dinner on your own. Overnight at your hotel in Santorini. Rainbow Tips: Make sure to enjoy as many sunsets as you can – don’t forget that they are ranked among the most impressive ones in the world! 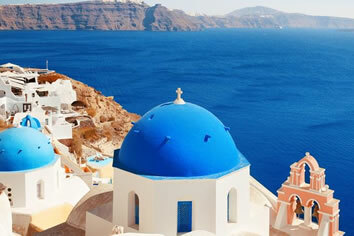 • Buffet Breakfast and free day to explore the magical island of Santorini. • Discover Fira & Oia with the breathtaking views to the volcano, and enjoy one of the best sunsets in the Aegean. • Explore the unique black-sanded beaches or take a boat tour to the islands of the caldera. • In the afternoon enjoy a special Wine Tour and taste the delicious Greek Wine together with typical local products. 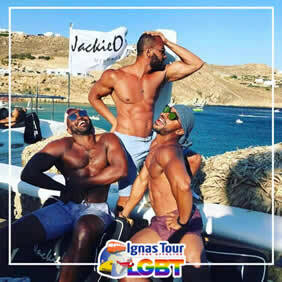 Rainbow Tips: Check out the main gay hot spots in the island: the last section of Vlychada Beach and the gay-friendly bar Tropical in Fira. • Breakfast in the hotel and transfer to the Santorini airport, or Santorini Harbour. Central Hotel is strategically situated in the picturesque area of Plaka, 200 m from Syntagma Square. It offers a rooftop terrace with hot tub and Acropolis view, and free Wi-Fi at the lobby. The Central Hotel rooms are air conditioned and include a safe and bathroom with hairdryer. Some have Acropolis view. Room service is available. The daily buffet breakfast includes fresh juices and local delicacies. The rooftop bar is the ideal place to have an evening drink while enjoying spectacular city views. The central shopping district of Athens is a short stroll from the hotel. 24-hour front desk offers luggage storage service. Private on-site parking is subject to availability. Right at the foot of the Meteora Rocks, in Kastraki village, and just steps from the Monastery of Saint Nikolaos Anapafsas, Dellas Boutique Hotel offers elegant rooms with free Wi-Fi and free parking. The famous monasteries, built on natural sandstone rock pillars and dating back to the 14th century, are close to Dellas Boutique Hotel Kastraki. The town centre of Kalabaka is only 2 km away. Free, multi-language brochures with all necessary information about the area are offered to all hotel guests. The stone-built hotel offers tastefully furnished rooms with views of Meteora, the mountains or the garden. Each of the spacious rooms is en suite and includes hairdryer. Buffet breakfast includes fresh fruits, vegetables, homemade marmalades and Greek yoghurt and is served daily at the hotel’s breakfast hall. Dellas Hotel also offers a lounge area with satellite TV, as well as a bar with fireplace. Situated conveniently in the middle of Mýkonos City, Hotel Rochari offers buffet breakfast and free WiFi. The hotel provides a seasonal outdoor swimming pool and a garden. Mykonos Windmills is 500 m away and Little Venice is a 6-minute walk from the hotel. The on-site restaurant serves Greek cuisine. Hotel Rochari offers a terrace. Non-stop assistance is available at the reception. All rooms and suites in the hotel are equipped with a flat-screen TV. Each room includes a private bathroom with a bath or shower and free toiletries. The units will provide guests with a fridge. Popular points of interest near the accommodation include the Archaeological Museum of Mykonos and Mykonos Old Port. The nearest airport is Mykonos Airport, 2 km from the property. Nammos Mykonos is 3.2 km away. Located right on the scenic beach, King's Suites is situated in Kamari in Santorini. The property offers a hot tub and a seasonal outdoor pool. A restaurant and a bar are also available on site. The picturesque cliffs of Imerovigli, from which guests may enjoy the famous sunsets of Santorini, is at 10 km. The famous White Beach is at 16 km. Santorini Airport is located within approximately 6 km of King's Suites. Combining traditional Cycladic decor with modern touches, each room is fitted with a flat-screen TV and safety deposit box. Every unit at King's Suites is air-conditioned and opens to a balcony with garden or Aegean Sea views. All rooms feature a bathroom fitted with a shower. Daily room service is provided. Free WiFi is available throughout.